I’ve searched high and low for a giraffe pattern that was free that I liked, I either had issues with how the ears looked or how the spots looked or it didn't have a suitable hair tuft....Some were cute but the patterns got a little wonky for me…Call me Goldihooks.... Plus I find I’m getting really bored reading patterns, I enjoy the challenge of coming up with my own. I’ve really only been using patterns from people that really have something crazy special. I guess we all go through different stages of our little ‘hobby.’ I’m not sure if this even qualifies as a hobby anymore. It’s more like an obsession… it’s my drug. Seriously. I HAVE TO HAVE A HOOK IN MY HAND or I’m only thinking about WHEN I can get that hook in my hand…When I’m done crocheting something there is a huge high….and then the downward spiral until I get my next fix. Ya…the deep end…I’m off it. 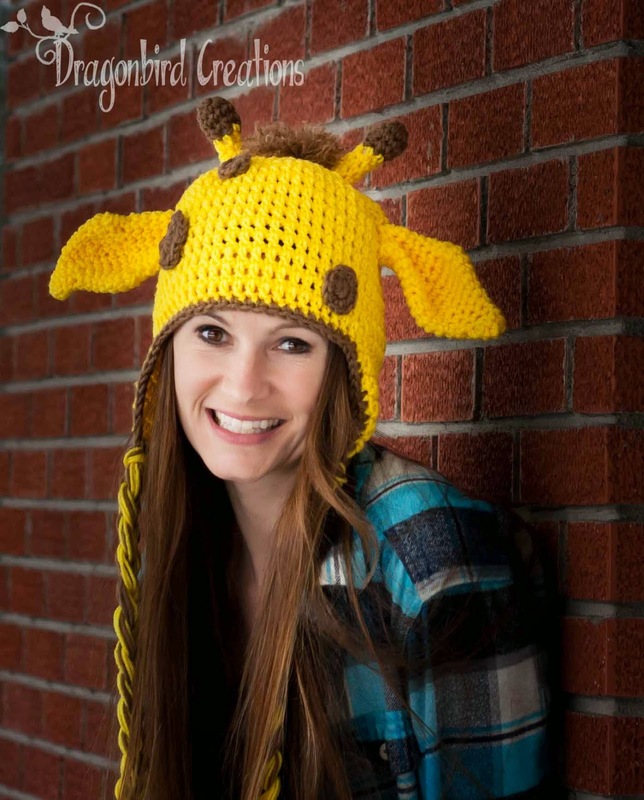 Feel free to do what you want with the hats you make using this pattern-sell, donate, give away. I do ask, that if you do use it, maybe let me know how I am doing on making patterns? With no input from anyone I will either continue stinking at patterns or think they stink and just quit before I confuse the world. Obviously, this is my pattern and I ask that you don't copy it and pretend it is your own because that's pretty tacky. ;) But feel free to provide a link. Gauge: Honestly, I've never paid attention to gauge. I crochet how I crochet and will modify a pattern to make my gauge work. BUT, although I'm an old dog I don't mind learning new tricks, so I will have to look up how to figure all that stuff out...For now I will tell you that for 11 dc going across that equals 4" and for 8.5 rows of dc it equals 4". I can also tell you that my finishing hat, that has 53 dc is 21" in circumference. Second ear flap. Fold hat in half so that only 3 stitches of first ear flap are on the front. Join yarn in 3rd stich from the center of the other side. Repeat rows 1-11 of ear flap. Finish off by attaching brown into any sc in hat. Ch 1, sc around edge of hat; join. finish off. 4. Ch 1, dec around (6 sc) finish off brown-stuff the brown part lightly now, it will be easier than doing it later. Hair tuft: I made a loose (not as many strands as a normal one) pom pom and attached it. After attaching I ratted out the yarn so it was more fluffy. You can fiddle around with different starting amounts of sc in your magic ring-Don’t make more than 10 though because it gets warpy if you do. Note: For that hat base I used that basic beanie hat pattern but only increased to 36 stitches (this will fit 3-6 months) and then made the hat 5" high. For the ear flaps I only did 7 sc instead of 11. Ears (Make two-these are worked in continuous rounds and we are not joining at the end of every round. Also, think of the numbers as STEPS and not actual rounds. 6. sc in next 18 sc, skip next sc, and join with sl st to next sc. Finish off, leaving a long tail for sewing and attach to head. Finish off yellow and leave a long tail for sewing. Lightly stuff and attach to head. Just reading through the pattern quickly, it looks good! You might consider giving a gauge, just for consistency for people who might be trying out your patterns. I've never tried an ear flap quite like that before (skipping over stitches instead of decreasing (single crocheting together)). I'm curious how it works up! I found your blog via pinterest, and while I haven't tried any of your patterns yet, I really appreciate your creativity and enthusiasm. :) Will definitely be following! Thank you for the advice! :) I've not had good luck figuring out gauge, I have my own hat patterns written up for sizes that will work based on how I crochet... but I will certainly look into it tomorrow, and see if I can't post something informative about my gauge. How do you sew on the horns and not make them look like floppy? Also, any tips for sewing on the ears? I'm terrible at sewing crochet items! The trick for the horns is to make sure they are at the top of the hat-so they stand up when the hat is on (your head filling the hat helps keep them standing at attention). The horns I fill a little more full than I normal fill stuffed crochet stuff so that they are more stiff. For the ears, I sewed them on so that they are up and down with a very slight angle toward the back as they go down. What I usually do with all my crocheted embellishments is I only tack them in place at first, with little stitches so I can move them around if needed-sometimes it takes two or three tries to get something in perfect place. 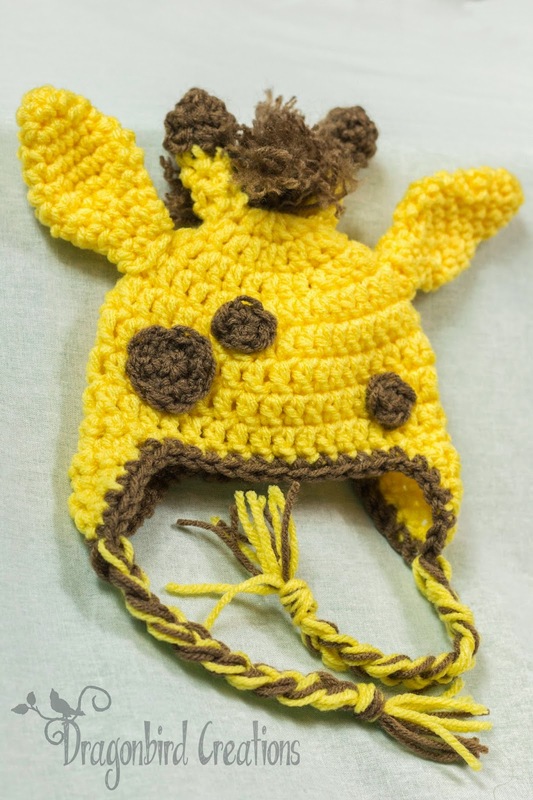 Never sew them permanently until you know they are placed right (which you must try the hat on to be sure of this) You can have the cutest little embellishments but if the placement is off you will come out with a creepy looking thing. Hope that helps a little. It took me a while to get the hang of ears (and that goes from puppies, giraffes, bears, kitties to you name it). My ears came out much smaller than pictured. I actually redid them, adding at least another ten rows to get them to the size in your picture. Looking at the project pictures in Ravelry, it looks like smaller ears were the frequent result. Otherwise it turned out great.